Las Vegas Stratosphere - Could You Handle the Thrills? Could You Handle the Stratosphere's Thrill Rides? 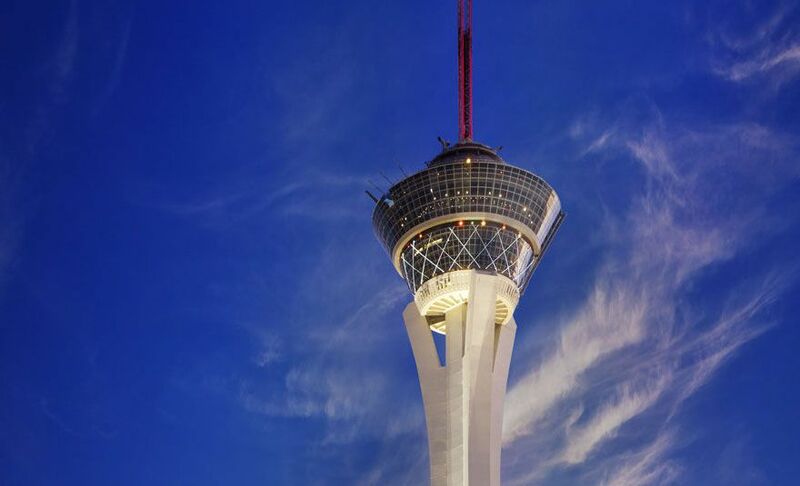 Even though Las Vegas' famed Strip is overloaded with glitzy neon lights and countless other distractions, it's kind of hard to miss the Stratosphere Tower. The nearly 1000-foot-tall behemoth is visible from anywhere in Sin City. In a town known to embrace the outrageous, it's still insane to discover that there are thrill rides atop the tower. Even more audacious than the people who thought of placing rides on top of the Stratosphere: the nuts who ride them. Would you be among the brave souls who would consider strapping in for a ride aboard the crazy contraptions? Unless you are especially hardy, it's likely that at least one one of the attractions would give you pause—if not send you running in the opposite direction with your tail between your legs. None of the rides would be particularly noteworthy if they were planted on the ground. But at more than 900 feet above terra firma, they're all beyond wild. One of them of them may just be the most thrilling, if not terrifying, ride on the planet. And two of the other rides would surely make it into the top-10 list. It's all about psychological thrills, and these rides give acrophobia a whole new meaning. Let's take a look at the rides in order of tamest to downright horrifying. You don't have to get the cold sweats wondering whether you'd have the nerve to ride High Roller. The Stratosphere dismantled the roller coaster in 2005 (to make room for some of the other rides that are listed below). High Roller (what a great name!) was a fairly wimpy coaster. At a top speed of 30 mph, no inversions, not much acceleration or g-forces, and hardly any drops, it was firmly in the "family" coaster category. Of course, hurtling around the top of the tower, even at 30 mph, was still harrowing. The sheer height, and the fear that the over-the-shoulder harness may not have kept you secured to the seat, the train may not have been securely affixed to the track, or the track may not have been securely attached to the tower, provided the thrills. Otherwise, High Roller was a mundane coaster. If you want to ride the rails, there are other Las Vegas roller coasters. By the way, the ride lives on—in name anyways. The Linq, which is also located on the Las Vegas Strip, repurposed the name for its 550-foot tall observation wheel. The High Roller is currently the world's biggest observation wheel. This is a hydraulic freefall drop tower, similar to many found at theme parks. But Big Shot is located at the very apex of the Stratosphere. It is a fairly standard 160-foot-tall version of the ride (some drop towers rise much higher). The base of the ride, however, sits at the 920-foot level and blasts up 160 feet from there. Keep in mind: Of the four rides that are open at the Stratosphere, this is probably the gentlest of the bunch. In terms of relative level of thrills, Insanity is probably on par with XScream, the ride that follows below. Both of them, however, are, well, insane. The centrifuge ride has seats tethered to an arm that swings out beyond the tower leaving riders dangling 900-plus feet in the air. As the ride begins its circular motion, the seats rise and tilt passengers downward to face the Strip. Insane indeed. This is another ride that can be found along the midways of many amusement parks. Again, what makes XScream different is that it is perched over 900 feet in the air at the edge of the Stratosphere. The ride resembles a giant seesaw. Passengers board it when the ride platform is teetered down. When the action begins, the platform rises and tilts in the other direction. That sends the vehicle racing headlong down the platform at an angle towards the Strip below. Magnetic brakes stop the vehicle at the end of the platform. Riders, however, are left to their own devices to stop freaking out. I'm not sure why the woman in the photo is smiling and looks so composed. Most people who ride SkyJump are probably terrified and screaming. The concept is disarmingly simple: Passengers suit up in a harness that's tethered to a pulley system, walk to the edge of a platform some 900 feet in the air, and jump off. Instead of freefalling to the Strip, the cables allow for a controlled drop that slows riders before they reach the bottom. This is probably the single most nerve-rattling ride experience on Earth. For liquid encouragement before the jump and some celebratory/sedative-acting pops after the jump, it's a good thing alcoholic drinks are cheap in Vegas. Prices vary for the Stratosphere thrill rides. The official Web site has info. Check out other Las Vegas theme parks, water parks, and attractions.